Supplejack vine is in the botanical family of Ripogonaceae, a family found only in New Zealand, eastern Australia and New Guinea. It is a hardy, evergreen climber. 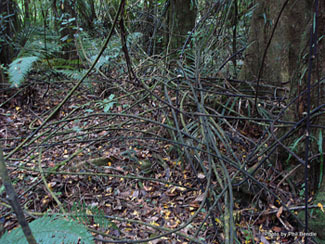 Early Maori used the tough stems of the Supplejack vine to tie the thatches roofs and walls of their homes. These were used to tie up fencing and platforms as well. Both the Maori and European settlers used this hardy vine to make crayfish pots, eel traps, ladders, flooring platforms in canoes, and baskets. As well as being used in construction, this vine is a great source of food and has been used as medicine. Various parts of the vine have been used for bowel troubles, rheumatism, fever, and as a blood tonic. Distinguishing Features: Supplejack vines climb by coiling; its stems around branches and tree trunks for support. Where there is an absence of support the vines drop to the ground and loop around the forest floor in a very dense entanglement making walking very challenging. In the first year of its life it resembles a small shrub so it isn’t until the second year it begins to take the shape of a vine. In the summer months its tips grow 5 centimetres daily. Once the Supplejack reaches full sunlight it produces non-twining leafy stems that bear flowers and fruits. Flowers: Individual flowers have six white to pale green or yellow tepals and they are very small. The tepals measure about 2mm long. The flowers are hermaphrodite and the flowers appear from December to February. Fields of Nutrition has medicinal benefits and vitamin/mineral content of Supplejack Vine. 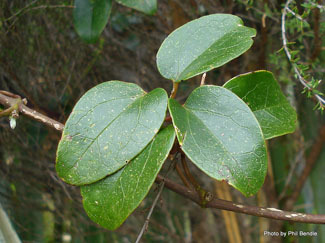 Leaves: The leaves are mostly opposite, green, dark green or yellow-green. They are narrow-ovate to oblong shaped, narrowed rather abruptly to the tip and they tend to undulate. Height: This vine can grow to several metres in length as it likes to grow toward the sunlight through the forests. 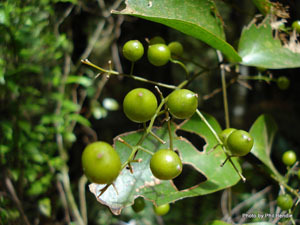 Habitat: Supplejack is a common vine that grows in lowland forests of New Zealand, and in the forests of Zealandia. It prefers light, sandy, loamy, and clay soils that are moist. It tends to grow in semi-shaded woodlands. It can also grow in swampy areas. 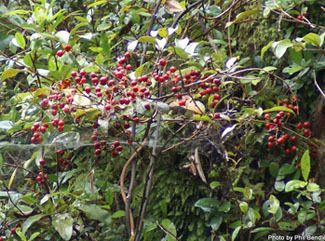 Edible parts: The berries are edible once they are ripe and can be eaten raw or cooked. Very young shoots are palatable and supposedly resemble asparagus in taste; it is best to eat these cooked. The seeds can be consumed and contain fatty acids. The sap can be consumed as well. The roots are known to be a substitute for sarsaparilla and they are rich in starch. Leaves are also edible. I want to send out a very special thank-you to Phil Bendle in New Zealand. Phil is the webmaster, researcher, and photographer for Te Henui on the website TERRAIN (Taranaki Educational Resource: Research, Analysis and Information Network). Phil has graciously permitted EdibleWildFood.com to use his photos.